A broad category of crystalline minerals, perovskites have been singled out as a new, photovoltaic (PV) material that could herald the day of cheap, ubiquitous solar energy. Laboratory researchers have been reporting record-setting gains in the energy conversion efficiency of perovskite PV cells and modules, which at around 23% in lab testing, now rivals that for the silicon PV cells and panels found in the vast bulk of solar energy installations worldwide. Moreover, PV scientists working in labs worldwide are fabricating nanometer-scale (1×10-9m) perovskite solar cells and modules that can be sprayed on to surfaces of any type, as well as applied on rigid form factors found throughout the economy and society, such as walls, windows, automobiles. 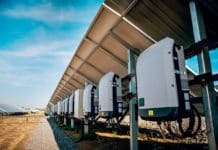 Some are focusing on integrating perovskite solar cells and modules with their silicon PV counterparts, which holds the prospect of boosting the resulting two-junction PV modules’ energy conversion efficiency substantially, possibly as much as 30%, according to perovskite PV pioneer Oxford PV. 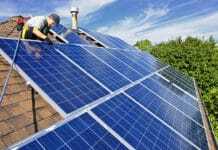 That could fuel a new, phase of declining solar energy costs and a corresponding boost in installed solar power generation capacity. Energy conversion efficiency is the foremost, but only the first of three, attributes PV scientists look for when searching for promising, new PV materials, however. To date gains in the stability and scalability of perovskite PV materials have lagged gains in energy conversion efficiency. A tight-knit, international community of perovskite PV R&D teams are intent on making up the difference, and they’re making substantial progress. Solar Magazine spoke with Dave Moore, a member of the US National Renewable Energy Laboratory’s (NREL) perovskite PV R&D group, which is undertaking cutting-edge, applied research aimed at paving the way towards commercialization and mass manufacturing of perovskite PV cells and modules across a broad front: from multi-junction perovskite-silicon and perovskite-thin film PV materials to building-integrated perovskite PV materials and others that can be spray-painted on to surfaces of practically any shape, size or form. Crystalline minerals, naturally occurring perovskites are made up of two inorganic elements and oxygen. The crystal structure of the first known perovskites, made up of calcium, titanium and oxygen was discovered in 1839 by Gustav Rose in the Ural Mountains. Significantly, it wasn’t until the late 19th century that scientists created a new type of perovskite by replacing oxygen atoms with halides – bromine chlorine or iodine, Moore recounted. Exploring their electrical properties, research scientists synthesized the first organic-inorganic perovskite molecules – methylammonium-lead-iodides, bromides and chlorides – around 1985. “These early researchers weren’t looking at perovskites as a PV material, but rather as conductors for batteries based on original reports regarding cesium versions that showed they were excellent ion conductors,” Moore elaborated. That opened up wide new vistas of perovskite applications in electronics and electrical engineering. Conducting R&D at IBM in the late 1990s and into the early 2000s, David Mitzi took things a big step further, synthesizing and experimenting with a wide variety of perovskites made up of different halides, metals and organic molecules. It wasn’t until 2009 that an R&D team led by Tsutomu Miyasaka at Toin University of Yokohama first used an organic-inorganic halide perovskite to fabricate a solar cell and module. Miyaska and team reported achieving an initial 9% energy conversion efficiency. Energy conversion efficiency has soared to 22.7% since, setting an PV materials R&D speed record, and further gains are expected. Learning all that’s required and successfully performing all the tasks and R&D work required to break into the leading ranks of the world’s scientists is no mean feat. Moore started out on that path at the tender age of 40. Having earned a BS in chemical engineering, Moore went on to complete his PhD at Cornell University in 2009, his work focused on research and development of solar quantum dots. It wasn’t until 2012 that Henry Snaith, a pioneer applied PV materials research scientist and leader of a perovskite PV R&D group at Oxford University, introduced Moore to perovskites. Snaith is a co-founder and serves on the board of Oxford Photovoltaics, which is in the midst of building the world’s first, industrial-scale perovskite-silicon PV manufacturing pilot plant in Germany. It wasn’t until 2010-2011 that Prof. Henry Snaith and his Oxford R&D team sent one of their PhD members, Michael M. Lee, to Japan to learn more about Miyaska and team’s method of synthesizing perovskite PV dyes and how it might be possible to improve upon and apply the process. Returning to Oxford, Lee and fellow researcher Thomas Leijtens noticed the devices performed better as they raised the concentration of the solution. They continued doing so until they determined a concentration 10-times that of Miyasaka’s original recipe resulted in an optimal methylammonium lead iodide solution. “Instead of a few nanocrystals, the resulting perovskite completely infilled and formed a capping layer [on the underlying titania substrate],” Moore told Solar Magazine. It was around a year later that Snaith and team published a seminal research paper, detailing the discovery and reporting a breakthrough in perovskite PV energy conversion efficiency – breaching of the 10% barrier. “All of a sudden, everyone had to take the idea of using perovskites as a promising, new PV technology,” Moore said. Gains in energy efficiency have come hard and fast since. It was around this time (2012) that Snaith began encouraging Moore to shift his R&D work from quantum dots to perovskites. Moore got caught up in the action. Moore worked with one of Snaith’s Oxford R&D team to fabricate a methylammonium-lead-triiodide PV cell that was applied to a new type of titania substrate developed by Uli Wiesner at Cornell University. “The ones we made were probably around 5% devices, not very good, but it turned out that Uli’s trick with titania really didn’t matter, and that there was really no reason to go through the extra processing,” Moore recounted. That was an important finding in that it eliminated the extra cost of having to go through an extra step in manufacturing. While the energy conversion efficiency of perovskite PV materials has risen sharply and rapidly, corresponding advances in improving the two other attributes applied PV materials scientists strive to achieve – stability and scalability – have been lagging. That’s not unusual, according to Moore. Of the three, scalability is typically achieved last. First comes stability, and then high performance [energy conversion efficiency]. Moore noted that NREL perovskite PV R&D team member Jeff Christians just had a research paper published regarding synthesis of the most stable perovskite solar cell to date. “So we’re getting there,” Moore commented. 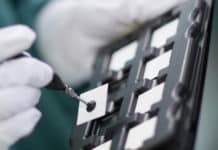 He also pointed out that several R&D teams have reported their perovskite solar cells and modules have passed industry-standard IEC (Internatioal Electrotechnical Commission) stress tests. Turning to scalability, Moore explained that researchers, in the main, are taking two approaches to developing the means to mass manufacture a wide variety of perovskite solar cells and modules for different applications: liquid coatings and vapor-phase deposition. The latter process is similar to that which is being used to mass manufacture thin-film, cadmium-telluride (CdTe) solar cells. Solution-based roll-to-foll mass manufacturing is used to produce newspapers. The second type of roll-to-roll processing, which entails vapor-phase deposition, is used commercially to layer the thin film of metallic foil found inside bags of potato chips and other snacks to keep them fresh and keep contaminants out, Moore pointed out. All things considered, “I have every reason to believe we will solve the stability problem,” Moore concluded. There is one caveat, however. The stress tests are designed for silicon and thin-film solar cells and modules. As they’re a new class of PV materials, perovskites may have attributes and qualities, either advantageous or detrimental, that are not revealed in ICE stress testing, Moore pointed out.